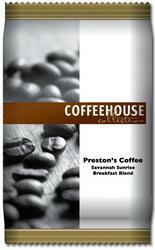 Preston's Savannah Sunrise - Breakfast Blend Coffee. Small Batch Roasted with a simple blend of specialty grade beans. Roasted to bring out the earthy tones and quality. Designed for coffee service use in the state of Georgia, but popular just about everywhere. 100% of the electricity used in the production of Preston's Coffee is generated from renewable resources (wind turbines and low impact water. We package it in a 100% recyclable container with no harmful inks and a simple paper label.